South Korean Kwon O-Hui (L) cries with her North Korean relative Ri Han-Sik (R) as they bid farewell following their three-day separated family reunion meeting at the Mount Kumgang resort on the North's southeastern coast, Oct. 22, 2015. Limits placed by North Korea on the upcoming inter-Korean family reunions could be a sign of the difficult road that lies ahead to implement the recent denuclearization agreements made by Kim Jong Un. North and South Korea agreed last week to allow 100 separated family members from each side of the border to meet at the North’s Mount Kumgang resort from August 20 to 26. “The scope of the agreement and the event is very disappointing because there are at least 50,000 registered separate family members alive in South Korea alone,” said Bong Young-shik, a political analyst with the Yonsei University's Institute for North Korean Studies in Seoul. Millions of Korean families were forced apart by the division of the country at the end of World War II. There are now close to 56,000 registered separated family members in South Korea, according to Ministry of Unification. Almost all of them are over 70 years old. “The reunion of separated families is an urgent problem that is racing against the clock due to the increasing number of deaths each day,” said Ahn Chan-il, a North Korean defector and analyst with the World Institute of North Korean studies. South Koreans on a bus touch the bus window in their attempt to feel the hands of their North Korean relatives as they bid farewell after the Separated Family Reunion Meeting at Diamond Mountain resort in North Korea, Monday, Oct. 26, 2015. The last inter-Korean family reunion took place in 2015 and involved 200 families from each side. At that time there were over 80,000 registered family members still alive in the South. The North’s agreement to hold only a single week of reunions for 100 families, falls far short of what many expected after Kim Jong Un and South Korean President Moon Jae-in promised “comprehensive and groundbreaking advancement of inter-Korean relations” in their joint declaration at the end of the inter-Korean summit in April. In 2000, the two Koreas agreed to hold regular reunions for separated families but due to political and military tensions between the repressive Kim government and the democratic South, these events have been held only sporadically. North Korea has also tried to withhold its participation in family reunions until certain political conditions are met, such as halting activists in the South from sending outside information into the North. Pyongyang has also rejected requests from Seoul to allow direct telephone communication and mail correspondence between separated families. 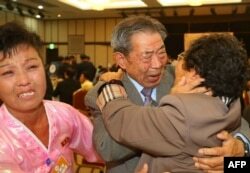 South Korean Min Ho-Sik, center, 84, hugs his North Korean relative Min Eun-Sik, right, 81, during a reunion meeting of family members separated after the Korean War at the Mount Kumgang resort on the North's southeastern coast, Oct. 20, 2015. “In North Korea, the separated families are the ones who are politically labeled as the family member of the ones who escaped to the South,” said Ahn Chan-il. It is unclear if North Korea will also attempt to narrowly interpret the denuclearization agreement Kim made with U.S. President Donald Trump at the Singapore Summit this month. But the leadership in Pyongyang does not seem ready to ease any restrictions that it may perceive as threatening the Kim family’s hold on power. “One thing is really clear, is that the Kim Jong Un leadership is very much anxious about making important changes, exposing the system to the influence of outside powers,” said Yonsei University's Bong Young-shik. Washington is expected to soon test North Korea’s denuclearization commitment by presenting a rapid timeline and "specific asks" of Pyongyang, according to an unnamed senior U.S. defense official. However, no specific measures were mentioned. This week Defense Secretary Jim Mattis visits China, South Korea and Japan, where he is expected to discuss implementing North Korea’s denuclearization agreement, and the U.S. decision to suspend major joint military drills between the U.S. and South Korea. Secretary of State Mike Pompeo is also expected to visit Pyongyang soon to lead the nuclear negotiation process. He has said Washington hopes to achieve major disarmament by North Korea within the next two and a half years, during Trump's current presidential term.